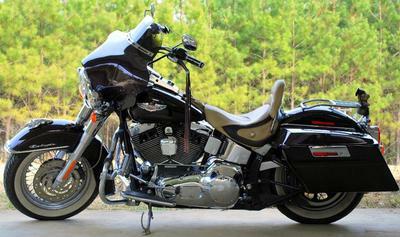 I ride a 2005 Harley Davidson Softail Deluxe. I have modified her since I first bought her in 2005. She does not look like a deluxe anymore! 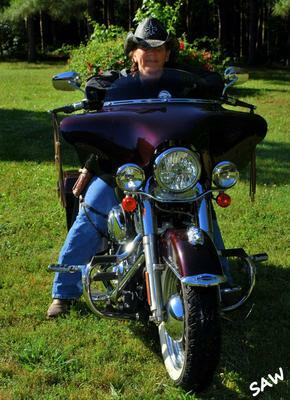 She has a springer backrest on the driver seat, 9 1/2 pull back riser's, hard bags, fairing and a 2 into 1 exhaust pipes. I recently put a sound system on her so we can listen to some tunes while riding down the road. I have been riding motorcycles since 1999. Where did you get the fairing? I love the mods to your deluxe. I have one on order for next year and am doing the two into one exhaust with hard bags. Where did you get your fairing? Gotta love the mods you've made to the deluxe. It looks great.